We’re offering our picks for the five best cabin tents to help you decide which one is best for your needs. Every one of them is a good value for the cost, none of them has serious flaws, and each one has at least one stand-out feature. How do you go camping with a big group and not step on each other’s toes? One way might be to stay in a cabin tent. Most cabin tents have a lot more headroom than standard tents because they have a dome or hip roof that allows the ceilings to be higher. Cabin tents also have extra square feet and more room for clothing and supplies. Most of them have storage pockets, and sometimes there’s an extra door. The prime benefit of staying in a cabin tent is the extra room you get from the higher ceiling and larger size. It’s a good choice if you have kids because of all the stuff you have drag along for them. With the extra space, there’s also the option of setting up cots instead of using sleeping bags. And if the weather’s nasty, it’s a lot more bearable to hang out in a cabin-size tent than to experience the forced togetherness of a smaller one. Most people believe that the more spacious a tent is the more complex the setup will be. But we’ve found a couple of examples that break that stereotype. If there’s a light sleeper in your group or a lot of extra equipment is needed, the additional room can make a big difference. Some tents come with their own ‘footprint’, or tent liner. If yours doesn’t, then just cut a sturdy waterproof tarp a few inches bigger than the tent on each side. Setting the tent up on top of a tarp will help it stay waterproof and protect the bottom of the tent. 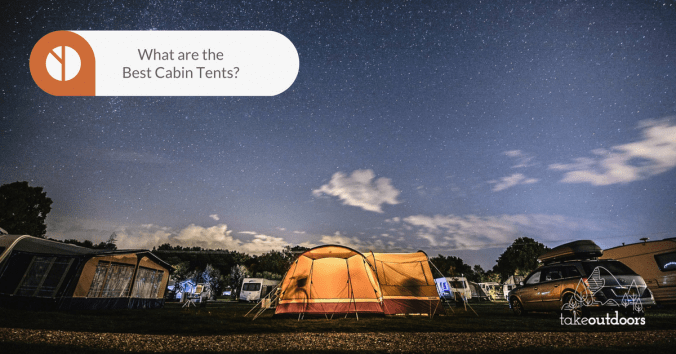 Cabin tents usually need to be staked down because of their size. Most are secured with guy lines as well, to add extra tension to the tent walls and keep the structure from blowing away in heavy winds. The ropes also keep the rainfly separated from the tent itself, helping it stay dry. 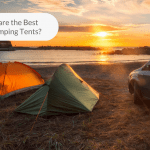 Tents usually have either aluminum or fiberglass poles. Aluminum is lightweight but tends to bend more easily. Fiberglass poles are sturdier, but they are also heavier. Polyester is better tent material than nylon because polyester is heavier and more waterproof, and it’s less likely to degrade under the sun’s ultraviolet rays. Some tents are also made of treated cotton for breathability. A cabin tent needs a door and windows that are large enough for ventilation. Each opening should have a mesh screen to keep out bugs, along with a privacy flap that keeps out wind and rain. When zipped closed, windows and doors should seal completely and be waterproof. Cabin tents usually have mesh ceilings with a rainfly overhead. A rainfly can be a flat tarp that sits a few inches above the tent. In more advanced designs, rainflies may have short, vertical sides attached for further protection, and even curved pieces over doors. Proper ventilation will keep moisture from beading up on the inside of the tent. Besides the mesh ceiling, some tents have vents near the floor to keep air flowing. In the best cabin tents, seams are also sealed with heat tape at the factory to prevent moisture from getting in. Storage space is one extra that makes camping easier. Mesh pockets provide a place to stash flashlights, cell phones, keys and other little items. Loops along the walls give you a place to hang towels and clothing. Having a vestibule is a luxury in a camping tent, especially when it’s rainy and muddy outside. This is a small entry area where you can leave muddy shoes before stepping into the main part of the tent. If you don’t have a vestibule, it helps to place a doormat just inside the door to the tent. Having two doors improves ventilation in the tent and gives better access when a big group is camping together. With an extra door, you don’t have to crawl over other people to get out of the tent at night for a bathroom break! There’s more to buying a tent than planning for how many people will be able to sleep in it. The weight and bulkiness are also important factors, depending on how you’re going to transport the tent and who’s going to set it up. Which is more important to you, standing room or a sleek design that will resist the wind better? 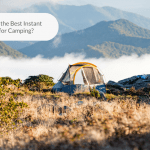 Depending on the camping conditions you envision, choosing a tent that’s highly rated to stay dry and stay put during storms might be a top consideration. When looking for a tent, you’ll see a manufacturer’s estimate of how many people each tent can comfortably sleep. You might want to size down by subtracting one or two people from this number. The number advertised usually doesn’t take into account clothing and supplies. You need enough room to move around without packing everybody in too tightly. Coleman advertises an advanced weatherproofing system ‘guaranteed to keep you dry’. There is a mesh roof, windows all around and one door. An interesting feature is that the door is hinged to make it more like a traditional door. There’s also a zip-in room divider curtain. Of all the cabin tents that advertise vertical walls, the Coleman is one of the two that truly have no slope to the walls, allowing the maximum amount of space. It takes about 20 minutes for two people to set up, and the tent has fiberglass poles. There’s enough room to fit two queen size air mattresses and plenty of standing room. The tent has a port for an electrical cord and it has two storage pockets. The WeatherTec system seems to be working as users report no leakage, even in heavy rain and wind. The tent folds up well and fits back into the original bag. 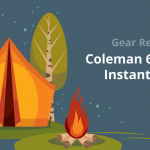 The Coleman tent included plastic tent stakes which don’t work as well as metal. And for a tent this size, it has minimal storage with only two mesh pockets. 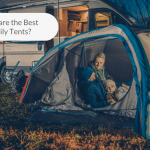 The weather-proofing is the top feature of this tent since user feedback indicates it rides out storms without leaking or collapsing. The hinged door is also a nice extra feature. Having a curved rain fly opening over the door means you don’t have to duck to enter the tent, and it’s supposed to offer extra protection from rain as well. There are two windows and a removable zippered divider curtain. The tent fits two queen-sized air mattresses with some extra room between them. Two people can set the tent up in 20 minutes, and it’s easy to get back in the bag. The roof is mesh, and there’s a port for an electrical cord, along with four storage pockets inside. This tent is lightweight but there have been no problems with it staying in place. The Wenzel tent does have six feet of head room for changing clothes, standing up, etc. However, it’s only in the middle of the tent. Most people would still have to crouch on the sides. There have also been complaints that the fiberglass poles are too thin and break easily, and the seams will only withstand heavy rains with an extra waterproofing treatment. This is the least expensive of all five tents we researched. It’s also extremely lightweight, even suitable for backpack camping. This is the other tent that truly has vertical walls for more square footage inside. The Standing Room also has an extra-high, 8.5-foot canopy ceiling. There are two large doors and two large windows, allowing a cooling cross-breeze in hot weather and plenty of ventilation. Setup only takes 10 minutes with two people and it easily fits back in the bag when taken down. There are four storage pouches and loop ties along the perimeter for clothing and towels, as well as a power cord port. This tent is unique in that it attaches to a canopy instead of using a rain fly. The canopy isn’t included, but the tent is easy to attach with the hooks provided. Having a canopy overhead instead of just a rainfly tarp makes it easier to withstand the elements. For some people, having to purchase the canopy separately would be an inconvenience. The tent does work with most 10 x 10 foot canopies, including the E-Z setup type. The door area needs extra sealing to keep it from leaking, and the door and window zippers can get stuck. The tent hangs from a canopy and doesn’t use poles, so it’s very easy to simply unfold it and hang it up. It’s also very lightweight at 11 pounds. This is the largest tent as far as square footage, but the 7.3 height is only in the middle third of the tent. It has two large doors and six windows, for lots of air flow. The nearly vertical side walls have mesh wall pockets, and the rainfly is rounded over the doors. Like the others, the tent has an electrical port and zip-in room divider. It takes two people 10 minutes to set up the tent. The poles are fiberglass, and the Browning is the only one of the five tents in the review with a crossed pole design. This gives it more strength and stability in high winds. There’s enough room for two queen air mattresses along with bags and equipment. The zippers have to be handled carefully because of large seams that cover them and get stuck easily. There’s also a slight gap remaining when they’re closed that allows small insects into the tent. The sturdy crossed pole frame is one of the best value-added features. It’s also a nice touch that when the curtain is up, each side of the tent has a separate entrance. There are two doors in the tent, and windows all around the perimeter. It has a room divider, two hanging storage pockets, an electric cord port and a center hook for a lantern. Besides the doors and windows, there are air vents in the tent at floor level. This helps it stay put in heavy rain and wind and prevents indoor moisture. This is the easiest tent to set up because of the pop-up frame with no poles to insert. It’s almost as easy to take it down and it fits into the original bag. This tent can fit two queen air mattresses with room to spare. It takes two hands to close the door zippers without snagging because of the flaps over them. The integrated frame allows instant setup, with no work guiding poles into sleeves. The maximum height extends to most of the tent. Each one of these tents has unique features. The Coleman will ride out the storm and keep your belongings and bedding dry. The Wenzel is so light you can take it backpack camping. The Standing Room seems much larger than its 10 x 10 footprint because of the vertical walls and 8.5-foot canopy ceiling. The Browning has the strongest frame, with its crossed fiberglass poles. And the Core basically sets itself up, as the only pop-up tent in the group. 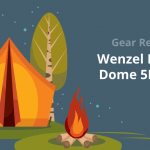 These are the five best cabin tents we’ve found, and the best value for the price, in our opinion, is the Core 9-Person Instant Cabin Tent. It has two doors, extra ventilation, and a high enough ceiling to allow just about any adult to stand up inside. And, we have to admit it…you had us at ’60-second setup’! What are the Best Beach Tents?